When the denizens of One Dupont learned of the Kennedy proposal, they pulled out all the stops to fight it. Legacy preferences are a key way for many colleges to maintain favor with deep-pocketed alumni, and early decision allows them to manage the admissions process with more predictability, and to lock in certain coveted applicants—often wealthy athletic recruits, who play sports like squash and lacrosse and whose parents can be expected to pay full price. During this same period, the federal government’s role in higher education began to increase, as Washington started subsidizing research more heavily, and regulating aspects of college life that had heretofore been seen as the exclusive purview of the institutions themselves—from the gender equity of their sports programs to the safety of their campuses. In response, higher education continued to beef up its lobbying presence. Then, in 1994, the Republican takeover of Congress brought to power a new wave of leaders with an essentially antagonistic attitude toward higher education as a whole, triggering a counter-mobilization by the lobby. With the Clinton White House as an ally, it successfully fought off Newt Gingrich’s efforts to gut federal student financial aid, and helped block a bid by then Senate Majority Leader Bob Dole—who was looking to burnish his conservative credentials in advance of his presidential run—to eliminate affirmative action programs. Over the next few years, the lobby won steady or increased funding for almost every key program. If higher ed’s reaction to a non-binding report that merely sought to identify strategies for improvement provoked charges of censorship, it isn’t surprising that the lobby has been even less willing to compromise when Washington has actually tried to legislate reform. For decades, education experts have been concerned about declining teacher quality in K–12 schools, and in the late 1990s the Clinton administration tried to address the problem by improving colleges’ notoriously lackluster teacher-training programs. The Education Department put together a proposal requiring states to report the percentage of teacher-training-program graduates from each school who pass the state licensure exam, and to report which of their education schools, many of which are affiliated with major universities, were underperforming. Schools that consistently failed to produce graduates capable of passing the exams would lose their eligibility to receive federal aid for teacher training. Another area in which higher ed has hardly been a profile in courage is the issue of private lending. Currently, students can receive loans for college either directly from the government or through federally subsidized private lenders. Direct loans are cheaper for the taxpayer, both because they don’t include the subsidy to the lender and because the federal government can borrow money at a better rate. Indeed, when President Clinton introduced direct lending, he sought to phase out the private- lender-based program altogether. But the private- sector bias of congressional Republicans (and their reliance on campaign contributions from the lending companies) thwarted that effort. Instead, schools are allowed to choose whether to participate in the direct-loan or the private-lender-based program. But perhaps the most damaging example of the lobby standing in the way of efforts to improve the system involves its opposition to efforts to make public more information on educational outcomes. 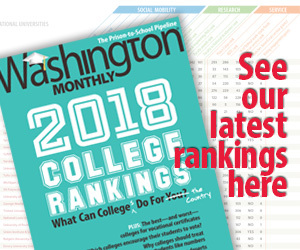 Currently, colleges report school-wide statistics on tuition and graduation rates to the federal government, but they’ve resisted providing Washington with more student-specific information.